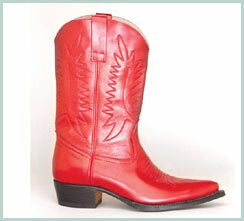 Nick’s Cowboy Boot – All regular leather options. Fully leather lined. Leather soles. Stitching optional. Toes available: chisel, point & super point. All shaft heights available including thigh high. All heel shapes & heights available. Priced from $475 Cdn. 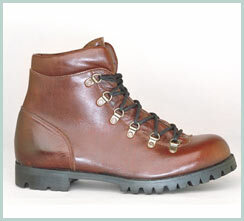 Nick’s Hiking Boot – Black/brown oiled leather, other leather options available. Fully leather lined or winter lining available. All sole options available, Vibram styles or leather. Spacers available. Speed hooks & cord laces. Priced from $425 Cdn. Nick’s Zippered Wellington – All regular leather options. 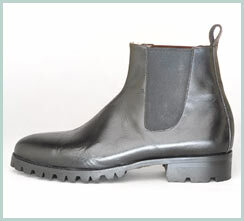 Fully leather lined.All sole options available, Vibram styles or leather. Spacers available. Priced from $425 Cdn. 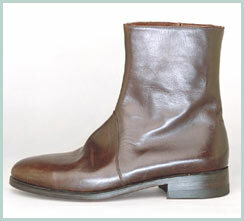 B52 Short Boot – Black/brown oiled leather, other leather options available. Fully leather lined. All sole options available, Vibram styles or leather. Spacers available. Steel toe available. Cord laces. 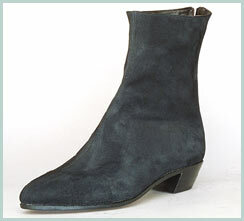 Priced from $375 Cdn. 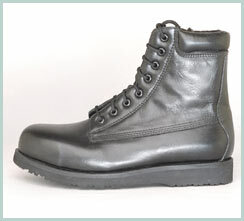 Eight Hole Lace Up Work Boot – Black/brown oiled leather, other leather options available. Fully leather lined. All sole options available, Vibram styles or leather. Spacers available. Steel toe available. Cord laces. Priced from $375 Cdn. 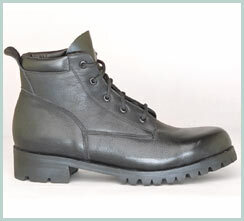 Fireman’s Bunker Boot – Black/brown oiled leather or black high shine police grade leather. Fully leather lined. All sole options available, Vibram styles or leather. Spacers available. Priced from $550 Cdn. 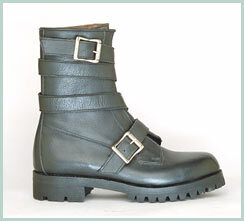 12″ Hunt Boot – Black/brown oiled leather. Choice of leather or winter lining. All Vibram sole options, plus spacers and water resistant band. Priced from $550 Cdn. 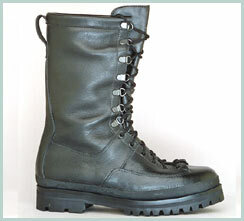 Nick’s German Tanker Boot – Black/brown oiled leather, or black high shine police grade leather. Fully leather lined. All sole options available, Vibram styles or leather. Spacers available. Priced from $450 Cdn. 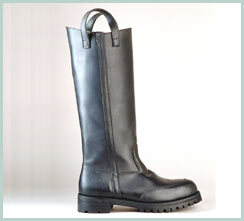 Nick’s Elasticized Wellington Boot – All regular leather options. Fully leather lined. All sole options available, Vibram styles or leather. Spacers available. Priced from $425Cdn.